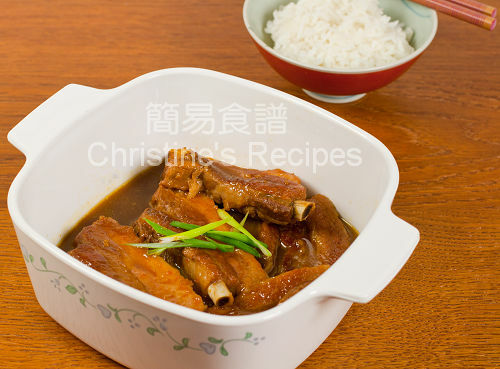 This stewed pork ribs in orange Juice dish is my family's all-time favourite. The pork rib meat nearly fell off the bones after being stewed in the orange juice for two hours, absorbed all the flavours of the sauce. It goes perfectly with a bowl of steamed rice. That said, the cold weather would help oranges grow juicier and sweeter. If it’s right, no wonder I can find many large and super sweet navel oranges at supermarkets in recent cold days. I bought a large packet of them as my snacks a few days ago. They were really juicy and meaty. I just used two of them to squeeze out one whole cup of juice to cook this stewed pork ribs dish. Rinse pork ribs and wipe dry with kitchen papers. Season with salt and pepper on both sides. Use a claypot or a large saucepan. Pour in the sauce and bring it to a boil over medium heat. 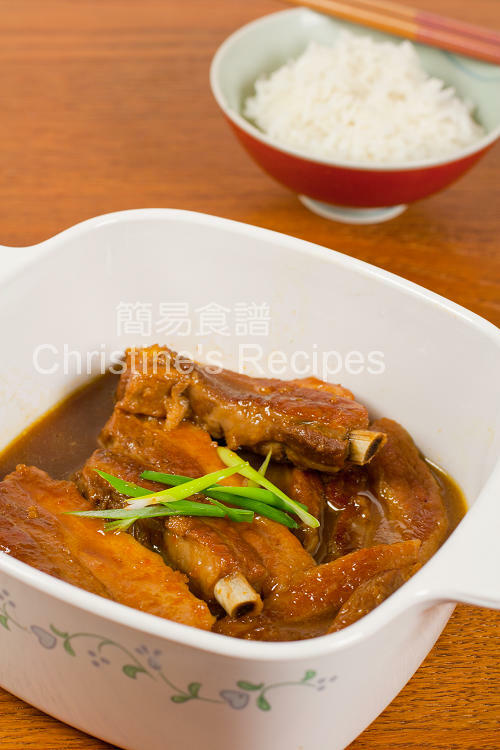 While heating sauce, brown pork ribs on a frying pan until both sides are lightly golden. Push pork ribs to sides of pan, add a bit more of oil and saute grated ginger and garlic until fragrant. Sprinkle wine. Quickly stir to combine all ingredients. Transfer to the boiling sauce and cover with a lid. Cook until it boils again. Reduce heat and simmer for 2 hours, or until sauce reduced to about 1/5, thickened, and the pork is softened and caramelized. Serve hot with steamed rice. The key and secret ingredient of this dish is the orange juice. The freshly squeezed orange juice penetrates into the pork and helps soften the meat. Choose sweet navel oranges to make this dish tasty and delicious. Taste the orange yourself and make sure they are sweet before you use them to cook this dish. I would complain too! I can eat all that myself! Yummy! A perfect combination of orange juice and pork. Love pork with orange juice, but seldom use zests as most of them seem to come with wax : (. Forgot to mention that I washed with a brush before grating the orange skin. I don't like the wax either. Oh yes! Oranges are so good now.... I will have to try this next time. This is so simple yet beautiful! Can you use minute maid orange juice with this recipe? I know fresh OJ would be better but in the winter time, the oranges are not as sweet. Yes, you can replace with any kind of orange juice as long as you like its flavour. I made this over the weekend!!! It's sooooo tasty. My bf said that I might have found a new favorite recipe. Ohhhh and i also added a bed of lightly sauteed onion to absorb the sauce and to add a lil crunch :-P YUMMY!!!! great recipe. meat is so tender and if you leave out the garlic, it's also very tasty and flavorful. Chrisine, your ribs are the best in the world! Love it! simple, fuss-free recipe that even first-time cooks can execute. thanks! This recipe was absolutely delicious! I tripled the portion to feed my huge family and they loved it. The orange makes it sweet and tangy, but it's not overbearing at all. And using the pork braising liquid as the sauce gives it such a meaty, savoury flavour :). Hi Christine, I've been visiting your website for a long time and really enjoy trying out some of your recipes. But these few days when I visited to read your recipes, I can't see the photos you've uploaded. I wonder if you're only allowing your members to see the photos? My blog is open to all. So everyone doesn't need to register as a member to view the recipes and photos. Hmmm...it'w weird. I can see all the photos. Really no idea why the photos not displaying to you. hi Christine I would like to know how to measure 1 cup chicken stock? using liquid type? if I use cube? The chicken stock is liquid. I used organic pork ribs. It's an easy and great recipe. I cooked this in my slowcooker/crockpot for about 4 hours. It's really delicious. The ribs were so tender they melted in your mouth. The sauce was citrusy and bery tasty. I served the ribs on a bed of warm steamed rice & steamed bok choy, and laddled the sauce over them.. It's amazing! Thanks so much for your support and liked my recipe. Your first attempt of using my recipe looks like a big success and your dish sounds very attractive. hi christine, i don't have raw sugar, can i use brown sugar?i also don't have white cooking wine, can i leave it out?thank you. If you don't have raw sugar, you can use regular white sugar. The brown sugar will make your dish too dark, and not too appealing. Yes, you can omit the wine if you don't have. hi Christine, can i use slow cooker to cook this? if yes, how long will it take? thank you. All stew dishes, including this one, can be made with a slow cooker. It's about 6 hours at least. If the pork is not soft enough, cook a bit longer then. Hello miss christine.i am a helper in malaysia and saw your recipe.can i use sake or shao shing wine for this recipe.thank you. both sake and shaoxing wine will work. Can I cook this recipe with the Instant Pot (Stew function)? Sure, use the "stew" function. Play around and experiment to find the optimal cooking time for producing the best results to your liking.